Lightweight and portable, the newly re-designed BabyBjorn Travel Crib Light provides your baby a safe, comfortable space for sleep or play at home or on the road. 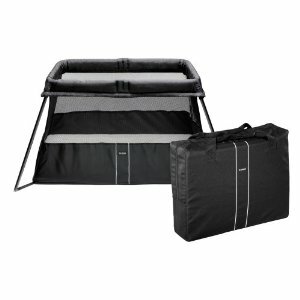 Especially convenient for busy parents, the Travel Crib Light 2 sets up in just seconds and features a plush, cozy mattress and a sturdy base that does not wobble. 32 x 44 x 24 in / 82 x 112 x 64cm.